There are many different types of protein assay, and variations upon the major themes. The topic is so dense that major biological supply companies typically extensive handbooks, that explain the details of each protein assay. Here we provide a simple overview of the different protein assay types. The aromatic side chains of amino acids absorb light in the UV range. This means that UV absorption can serve as a readout of aromatic amino acid proportion and can help with protein identification and concentration. This is a relatively nonspecific method of quantifying protein concentration. The sample is carried by liquid solvent at high pressure through an adsorbent column. Different amino acid side chains interact more or less with the material. The side chains that react the least move fastest through the column and those that react the most move slowly. The proteins are fractionated as they flow out of the column. Each fraction is detected and identified either by UV/vis spectrometry or by mass spectrometry. reagent+protein=color change proportional to concentration of protein. The specificity of antibody-antigen reactions means that there are other methods available for their detection and quantification. One of these is an enzyme-linked immunosorbant assay (elisa). This involves a detection enzyme linked to an antibody that specifically binds to the antigen of interest. Another useful system is biotinylation, which takes advantage of the affinity between the proteins biotin and streptavidin. Additionally, for procedures requiring protein capture and identification it is often helpful to use biomagnetic separation in which magnetic nanoparticles are conjugated with antibodies targeting a specific antigen. Antibodies and antigens are used in many multiplex assays. Multiplex assays are able to detect the presence of many different proteins in a single sample. This greatly reduces the volume of sample required for the assay. New chip-based technologies are coming to the fore; it is now possible to quantitatively measure the concentrations of multiple antibodies or antigens in a sample at the same time. Some of these systems require beads and fluorescent labels, while others are label-free, meaning that the interaction of antibody and antigen can be measured without the addition of a secondary antibody or colorimetric, chemiluminescent, or fluorescent label. These assays will soon be performed on a silicon chip ¼ the size of a postage stamp. 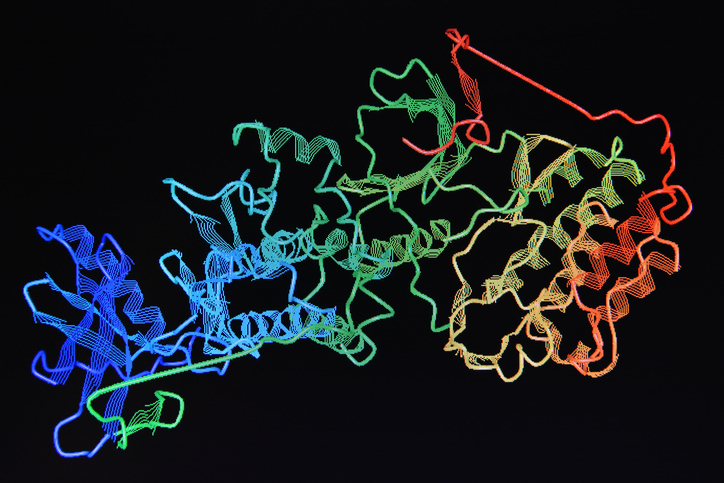 Proteins assays are also being developed using aptamers in place of antibodies. Aptamers are single-stranded oligonucleotides that adopt specific 3D structures that conform to specific proteins of interest. These aptamers are created and selected for using SELEX technology, which is an adaptation of dynamic combinatorial chemistry techniques. Once a “hit” is identified, it often has a high affinity for its target molecule, often with dissociation constants in the µM to nM range. The use of oligonucleotides in place of antibodies opens up a new realm of conjugation and material possibilities for protein assays.